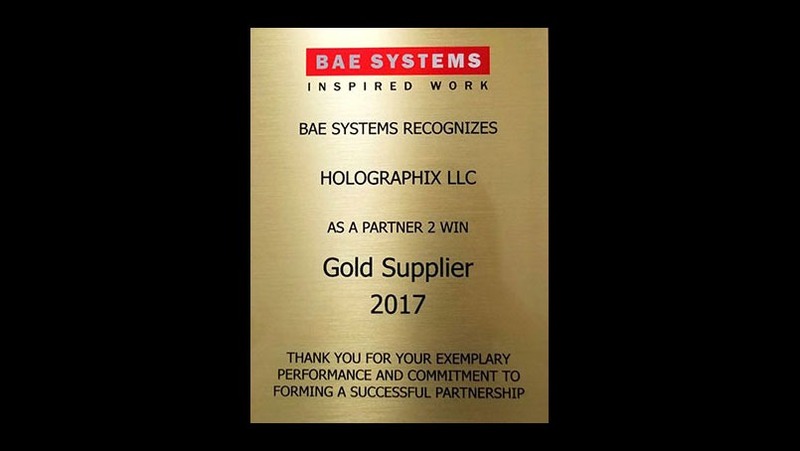 Holographix LLC was recently presented with a BAE Systems’ 2017 Gold Supplier Award. BAE Systems’ Electronic Systems sector, based in Nashua, N.H., presents this award to suppliers that consistently provide high-quality, on-time delivery of cost-effective products. Holographix has successfully achieved the required performance with a 100 percent quality rating, and a 100 percent on-time delivery for 2017. “This achievement is a testimony to Holographix’s commitment to provide products and services that meet or exceed our customers’ expectations,” said David Rowe, president and CEO of Holographix.